So many of you know, I’m vegetarian; which may make what I’m about to do seem kind of strange, but bear with me. Of late, I was reviewing the audio version of the book, The Veganist: Lose Weight, Get Healthy, and Change the World by Kathy Freston. It is a book about, well, veganism. I will try (unsuccessfully, no doubt) to avoid commenting on the book’s content; that is a post (actually several posts—see, there I go again) for another time. My focus right now is simply on the cover and its presentation. I'm having trouble swallowing this cover. Or rather, I'm feeling messages coming from this cover are problematic. The iconography of the cover is problematic. Here is a blonde-hair, green-eyed fashionable woman serving me (the presumable purchaser of the book), aq beautiful, but largely hard to decipher play of food. She's clearly in a kitchen or some room connected to the kitchen. Taken together, here is our way to "lose weight, get healthy, change the world"; keep one of these domestic goddesses on hand as needed. Ok, that is being a little snyde. The frustration comes from the idea that this book cover as presented seems problematic. By presenting a an iconic fixture of American culture (a domestically-placed and conventially attractive woman serving up food; to be read as harmless or nonthreatening), the publishers want to entice and not scare away people; invite them in to exploring the content. I could get behind that (though again, not with the overused staple of a nonthreatening domesticated woman at hand). However, it's the name change that also feels irksome. Getting concerned about changing the name from Vegan or Veganist seems pedantic and petty. Sure, I could get behind that too; but I'm not sold that the name change taken in connection with the visual presentation doesn't speak to larger problem. By using "veganist" instead of vegan, it distinguishes itself from Vegans. It says, "This is what a veganist looks like." The underlying implication: we all know what vegans look like and we view that derogatorily (a point even Freston mentions in her book in explaining why she's a "veganist"), so we'll avoid them. In doing so, Freston (and the publishers), help perpetuate vegans as a cultural-negative stereotype. All the while, Freston depends on their ideas, their work,and their arguments to convince the reader that they too should be "veganists." This repackaging of veganism is an attempt to make its practices more popular and accessible to people, but at the expense of people who are already predisposed to veganism's tenets. This certainly isn’t the first time something like this has happened, I’m just curious to see how vegans will react to this book or whether it will have a further effect on the representations of vegans in popular culture. I think there is something to be said about some of the ways veganism is used by certain vegans with a holier-than-thou attitude. However, I don’t think Freston within the book with her syrupy prose and Glenn Beck-like treatment of science, religion, and “research” is much better. She doesn’t come across as and absolutist per se (see video below for an amusing example) but she trades in fanaticism for misrepresentation…of not just her cover, but her content as well. Interesting post. 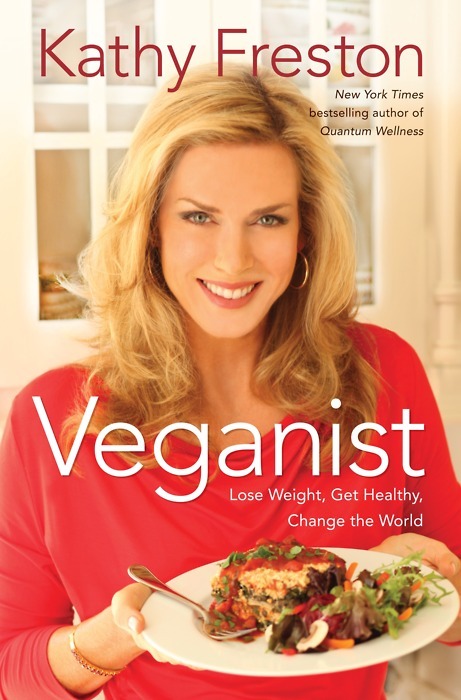 My first thought was that this woman on the cover didn't seem to have that holier-than-thou attitude that certain vegans have. This attitude often puts me off especially since I don't see why these individuals have to have this attitude - its not necessary and it doesn't make one want to find out more. Far from it actually. This atttitude screams intolerance in fact that others might have a different view on thing. It's really tragic since it prevents others from asking questions about vegan diets etc. I agree that the attitudes of the base (in any field really: comics, religious groups, literary critics) often produce this result. I was troubled by this particular book because I appreciate the fact that people are finding ways of gaining more followers or at least people partially interested in more environmentally and (potentially) ethically friendly means of food and diet, but found it problematic because in some ways, it provides a lot of mis-information (i.e. makes claims that Jesus would definitely veganish diet...ummm what about the loaves and fishes incident?) and often makes really big promises that she seems to say only happen with veganism but are really trends of any healthy lifestyle. It's like the Twilight series for me. Grossly misogynistic and therefore problematic but also, something that has gotten lots of people reading....argh!